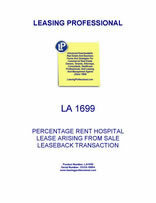 This Lease (“Lease”) is made as of _________________, by and between COMMERCIAL PROPERTY LANDLORD, INC., a __________________ corporation (“Landlord”), and AGREEABLE HOSPITAL TENANT, INC., a _________________ corporation (“Tenant”), a wholly owned subsidiary of ______________________, a ____________ corporation ("Tenant’s Parent”). A. Landlord and Tenant have entered into the Purchase and Sale Agreement of even date herewith (the "PURCHASE AGREEMENT") pursuant to which Landlord has agreed to purchase from the Tenant certain real property utilized in connection with the operations of "_________________," a general acute care hospital located in ______________, _____ and licensed to operate ____ beds, and related facilities, including but not limited to, the Property (as defined in Article II). Landlord's interest in the Property will be subject to the terms and provisions of the Existing Leases. B. As an inducement to Landlord to enter into the Purchase Agreement, Tenant has agreed hereby to lease the land and improvements comprising the facility from Landlord and to secure its obligations to Landlord under this Lease as provided herein. For all purposes of this Lease, unless otherwise expressly provided in this Agreement or the context in which such term is used indicates a contrary intent, (a) the terms defined in this Article shall have the meanings ascribed to them in this Article, (b) all accounting terms not otherwise defined in this Article shall have the meanings ascribed to them in accordance with generally accepted accrual method accounting principles at the time applicable, (c) all references in this Lease to designated "Articles," Sections" and other subdivisions are to the designated Articles, Sections and other subdivisions of this Lease and (d) the words "herein," hereof" and "hereunder" and other words of similar import refer to this Lease as a whole and not to any particular Article, Section or other subdivision. "ABSOLUTE ASSIGNMENT OF SUBLEASES AND RENTS" shall mean the Absolute Assignment of Subleases and Rents of even date herewith by and between Landlord and Tenant. "ADDITIONAL CHARGES" shall have the meaning ascribed to such term in Section 4.7. "AFFILIATE" of any person or entity (the "Subject") shall mean (a) any person which, directly or indirectly, controls or is controlled by or is under common control with the Subject, (b) any person owning, beneficially, directly or indirectly, ten percent (10%) or more of the outstanding capital stock, shares or equity interests of the Subject or (c) any officer, director, employee, general partner or trustee of the Subject or any person controlling, controlled by or under common control with the Subject (excluding trustees and persons serving in similar capacities who are not otherwise an Affiliate of the Subject). As used in this definition, the term "person" means and includes governmental agencies and authorities, political subdivisions, individuals, corporations, limited liability companies, general partnerships, limited partnerships, stock companies or associations, joint ventures, associations, trusts, banks, trust companies, land trusts, business trusts and any other entity of any form whatsoever, and "control" (including the correlative meanings of the terms "controlled by" and "under common control with"), as used with respect to any person, shall mean the possession, directly or indirectly, of the power to direct or cause the direction of the management or policies of such person, through the ownership of voting securities, partnership interests or other equity interests, or through any other means. "APPLICABLE CPI PERCENT" shall mean the percent equal to (x) the quotient of (i) the CPI most recently published as of the date that payment of Percentage Rent for the last Calendar Quarter of such Calculation Period is due, divided by (ii) the CPI as of the comparable prior year date; minus (y) one, but in no event less than ____%. "APPRECIATION AMOUNT" shall mean the amount, if any, by which the Fair Market Value of the Property exceeds Landlord's Total Investment. "AWARD" shall have the meaning ascribed to such term in Section 16.1(c). "BASE GROSS REVENUES" shall mean, for the Fixed Term, the Gross Revenues for the 12-month period commencing with the first full day of the first full calendar month of the Fixed Term and, for any Extended Term, the Gross Revenues for the Base Year. "BASE RENT" shall mean, for the Fixed Term, $____________ per annum (prorated as of the date hereof) and, for each Extended Term, the amount determined pursuant to Section 3.2. "BASE RENTAL RATE" shall mean for any Calculation Period the quotient of (a) the Base Rent payable with respect to such Calculation Period divided by (b) the Landlord's Total Investment for such Calculation Period. "BASE YEAR" shall mean with respect to each Extended Term the 12-month period ending with the last day of the last full calendar month immediately preceding the commencement of such Extended Term. "BUSINESS DAY" shall mean any day on which banking institutions in __________ __________ are open for the conduct of normal banking business. "CALCULATION PERIOD" shall mean a period of 12 consecutive months commencing with the first day of the first full calendar month of the Fixed Term or any anniversary of such date. "CALENDAR QUARTER" shall mean the three-month periods in each calendar year ending on March 31st, June 30th, September 30th and December 31st, respectively. "CAPITAL ADDITIONS" shall mean (a) one or more new buildings located on the Land or to be used, directly or indirectly, as part of the Facility, (b) one or more additional structures annexed to any portion of any of the Improvements, (c) the material expansion of existing Improvements, (d) the construction of a new wing or new story on existing Improvements, or (e) any expansion, construction, renovation or conversion of existing Improvements or the installation of new Fixtures therein to (i) increase the bed or service capacity of the Facility or (ii) change the purpose for which the Facility is utilized. Notwithstanding anything to the contrary contained in Article XI, in the event it is necessary to abate or otherwise take corrective action with respect to the existence of a Hazardous Substance (as hereinafter defined) located in, on or under the Property or in the Improvements, such abatement or corrective action shall not be deemed to be a Capital Addition and shall be the sole responsibility of Tenant at its sole cost and expense. "CAPITAL ADDITIONS COST" shall mean the cost of any Capital Additions. Such cost shall include (a) the costs of constructing the Capital Additions, including site preparation and improvement, materials, labor, supervision, developer and administrative fees, the costs of design, engineering and architectural services, the costs of fixtures, the costs of construction financing (including, if funded, by Landlord, capitalized interest at a rate equal to the Prime Rate plus _____ basis points) and other similar costs approved in writing by Landlord, (b) if agreed to by Landlord in writing in advance, the purchase price and other acquisition costs, or applicable ground lease rental payable for any period such ground lease is in effect to and including the date upon which such Capital Addition is completed and occupied or in operation, as the case may be, of any land which is acquired or leased for the purpose of placing thereon all or any portion of the Capital Additions or for providing means of access thereto, or parking facilities therefor (including the costs of surveying the same and recording, title insurance and escrow fees and charges), (c) insurance premiums, real estate taxes, water and sewage charges and other carrying charges for such Capital Additions during their construction, (d) fees and expenses of legal counsel, (e) any documentary transfer or similar taxes, (f) any applicable regulatory or administrative fees and charges, and any costs, charges, fees or expenses paid or incurred in connection with obtaining any applicable permits, licenses, franchises, authorizations, certificates of need, certificates of occupancy and similar authorizations and entitlements and (g) all other reasonable costs and expenses of Landlord or Tenant, as applicable, and any lending institution which has committed to finance the Capital Additions, including, but not limited to, (i) the fees and expenses of their respective legal counsel, (ii) any printing, duplicating and messenger expenses, (iii) any filing, registration and recording taxes and fees, (iv) any documentary transfer or similar taxes, (v) any title insurance charges and appraisal fees, (vi) any rating agency fees and (vii) any commitment or similar fees charged by any lending institution financing or offering to finance any portion of such Capital Additions. "CAPITAL ADDITIONS DEPRECIATION" shall mean the depreciation schedule applicable to Capital Additions as mutually agreed by Landlord and Tenant. "CASH FLOW" shall mean, for any period of determination, an amount equal to the sum of the amounts for such period of (i) net income before income taxes and interest expense, (ii) depreciation, amortization and other similar non-cash charges, (iii) Base Rent and (iv) Percentage Rent. "CLAIMS" shall have the meaning specified in Section 22.1. "COMMENCEMENT DATE" shall have the meaning ascribed to such term in Section 3.1. "CONDEMNATION" shall have the meaning ascribed to such term in Section 16.1(a). "CONDEMNOR" shall have the meaning ascribed to such term in Section 16.1(d). "CONSOLIDATED FINANCIALS" shall mean, for any fiscal year (or other accounting period) for Tenant and Affiliates thereof statements of earnings, retained earnings and cash flows for such period and for the period from the beginning of the respective fiscal year to the end of such period and the related balance sheet as at the end of such period, together with the notes thereto, all in reasonable detail and setting forth in comparative form the corresponding figures for the corresponding period in the preceding fiscal year (or period), all of which shall be prepared in accordance with generally accepted accounting principles. "CPI" shall mean the Consumer Price Index for the region in which the Facility is located (All Urban Consumers, 1982-84=100). "DATE OF TAKING" shall have the meaning ascribed to such term in Section 16.1(b). "ENCUMBRANCE" shall have the meaning ascribed to such term in Article XXVII. "EVENT OF DEFAULT" shall have the meaning ascribed to such term in Section 17.1. "EXCESS REVENUE" shall mean, with respect to each Calculation Period, the difference between the Gross Revenues for such Calculation Period and the Base Gross Revenues. "EXISTING LEASES" shall mean those certain leases described in EXHIBIT C.
"EXTENDED TERM" shall have the meaning ascribed to such term in Section 3.2. "FACILITY" shall mean the _____ bed general acute care hospital presently operated on the Land, or with Landlord's consent, such other general health care facility, general health and rehabilitation hospital, nursing home, retirement center, congregate living facility, health care related apartments or hotel, medical office building or other medical facility with treatment, diagnostic or surgical facilities for inpatient or outpatient care (which may include, without limitation, acute care inpatient facilities, skilled nursing facilities, intermediate care facilities, home health care agencies, ambulatory care clinics or similar facilities) offering other related health care products and services being operated or proposed to be operated on the Land from time to time in accordance with the provisions of this Lease. "FACILITY MORTGAGE" shall have the meaning ascribed to such term in Section 14.1. "FACILITY MORTGAGEE" shall have the meaning ascribed to such term in Section 14.1. "FAIR MARKET RENTAL" shall mean, with respect to the Property (including any Capital Additions or portions thereof paid for by Landlord) the rental paid on a net basis as provided in Section 4.8 hereof which a willing tenant not compelled to rent would pay to a willing landlord not compelled to lease for the highest and best medical use and occupancy of such property permitted pursuant to this Lease for the term in question, assuming that Tenant is not in default under this Lease, but without taking into account Percentage Rent. For purposes of this Lease, Fair Market Rental shall be determined in accordance with the appraisal procedures set forth in Article XXV or as otherwise mutually agreed upon by Landlord and Tenant. "FAIR MARKET VALUE" shall mean, with respect to the Property, including all Capital Additions, the price that a willing buyer not compelled to buy would pay to a willing seller not compelled to sell for such property (except as otherwise provided below), assuming that (a) this Lease is not in effect with respect to the Property, (b) such seller must pay any closing costs and title insurance premiums with respect to such sale, and (c) the Property is fully licensed by all governmental agencies having jurisdiction thereof, and is and will continue to be operated for the Primary Intended Use and is otherwise a going concern. Notwithstanding the foregoing, the computation of Fair Market Value shall assume that this Lease is in effect with respect to the Property in the event that Tenant elects to acquire the Property pursuant to Section 15.2(b). For purposes of this Lease, Fair Market Value shall be determined in accordance with the appraisal procedures set forth in Article XXV or as otherwise mutually agreed upon by Landlord and Tenant. "FISCAL YEAR" shall mean the 12-month period commencing January 1 and terminating December 31. "FIXED TERM" shall have the meaning ascribed to such term in Section 3.1. "FIXTURES" shall have the meaning ascribed to such term in clause (c) of Article II. (xi) revenues attributable to services actually provided at locations other than the Property, such as home health care and other services. "HAZARDOUS SUBSTANCES" shall mean those substances, materials, and wastes listed in the United States Department of Transportation Table (49 CFR 172 101) or by the Environmental Protection Agency as hazardous substances (40 CFR Part 302) and amendments thereto, or such substances, materials and wastes which are or become regulated under any applicable local, state or federal law including, without limitation, any material, waste or substance which is (i) hydrocarbons, petroleum and petroleum products, (ii) asbestos, (iii) polychlorinated biphenyls, (iv) formaldehyde, (v) radioactive substances, (vi) flammables and explosives, (vii) described as a "hazardous substance" pursuant to Section 311 of the Clean Water Act, 33 U.S.C. Section 1251 et seq. (33 U.S.C. Section 1321 or listed pursuant to Section 307 of the Clean Water Act (33 U.S.C. Section 1317), (viii) defined as a "hazardous waste" pursuant to Section 1004 of the Resource Conservation and Recovery Act, 42 U.S.C. Section 6901 et seq. (42 U.S.C. Section 6903), (ix) defined as a "hazardous substance" pursuant to Section 101 of the Comprehensive Environmental Response, Compensation and Liability Act, 42 U.S.C. Section 9601 et. seq. (42 U.S.C. Section 9601), as the same may be amended from time to time, or (x) any other substance, waste or material which could presently or at any time in the future cause a detriment to or impair the value or beneficial use of the Land or other Property (which, for purposes of this definition shall include all air, soils, ground water, surface water and soil vapor) or constitute or cause a health, safety or environmental hazard on, under or about the Land or other Property or to any person who may enter on, under, or about the Land or other Property or require remediation at the behest of any governmental agency. "IMPACTED FACILITY" shall have the meaning specified in Section 15.2. "IMPOSITIONS" shall mean all taxes (including without limitation all real property taxes imposed upon the Land, Improvements or other portions of the Property, including, but not limited to all tangible and intangible personal property, ad valorem, sales, use, single business, gross receipts, transaction privilege, documentary stamp (if any are associated with this Lease or the transactions contemplated hereby), rent or similar taxes relating to or imposed upon Landlord, any portion of the Property, Tenant or its business conducted upon the Land), assessments (including without limitation all supplemental real property tax assessments or assessments for public improvements or benefit, whether or not commenced or completed prior to the date hereof and whether or not to be completed within the Term), ground rents, water, sewer or other rents and charges, excises, tax levies, fees (including without limitation license, permit, franchise, inspection, authorization and similar fees) and all other governmental charges, in each case whether general or special, ordinary or extraordinary, foreseen or unforeseen, of every character or nature whatsoever with respect to or connected with the Property or the business conducted thereon by Tenant (including all interest, penalties and fines thereon due to any failure or delay in payment thereof) which at any time prior to, during or with respect to the Term hereof may be assessed or imposed on or with respect to, or may be a lien upon (a) Landlord's interest in the Property, (b) the Property or any part thereof or any Rent therefrom or any estate, right, title or interest therein, (c) Landlord's capital invested in the State as represented by the Property, or (d) any occupancy, operation, use or possession of, or sales from, or activity conducted on or in connection with the Property or the leasing or use of the Property or any part thereof by Tenant. "IMPROVEMENTS" shall have the meaning ascribed to such term in clause (b) of Article II. "INITIAL INVESTMENT COST" shall mean $____________. "INSURANCE REQUIREMENTS" shall mean all terms and conditions of any insurance policy required by this Lease and all requirements of the issuer of any such insurance policy. "LAND" shall mean all of that certain real property situated in the City of ________________, County of __________, State of __________ and more particularly described in EXHIBIT A attached hereto and incorporated herein by reference, and any other parcel of land acquired or leased and made subject to this Lease in connection with a Capital Addition. "LANDLORD LENDER" shall have the meaning ascribed to that term in Section 14.1. "LANDLORD'S TOTAL INVESTMENT" shall mean an amount equal to the sum of (y) the Initial Investment Cost and (z) all Capital Additions Costs pertaining to the Property paid for by Landlord pursuant to Section 11.2 of the Lease. "LANDLORD'S TRANSACTION EXPENSES" shall mean all out-of-pocket expenses reasonably incurred by Landlord in connection with (i) the preparation of this Lease, the Purchase Agreement and any Substitute Lease and the instruments contemplated hereunder and thereunder, and any other instruments required to be executed and delivered by Tenant to Landlord in connection, herewith or therewith (whether or not the transactions hereby or thereby contemplated shall be consummated) and (ii) the transactions contemplated to be performed hereunder and thereunder, including but not limited to the reasonable fees and disbursements of Landlord's legal counsel, title insurance premiums, recording taxes and fees, survey fees, valuation or appraisal fees, engineering fees and architects' fees. "LEASE" shall mean this document, as the same may be amended from time to time in accordance herewith. "LEGAL REQUIREMENTS" shall mean all federal, state, county, municipal and other governmental statutes, laws, rules, orders, regulations, ordinances, judgments, common law, decrees and injunctions affecting the Property or the maintenance, construction, use, alteration, occupancy or operation thereof, whether now or hereafter enacted and in force (including any of the foregoing which may require repairs, modifications or alterations in or to the Property), all permits, licenses, certificates, franchises, authorizations, land use entitlements, zoning and regulations relating thereto, and all covenants, conditions, agreements, restrictions and encumbrances contained in any instruments, either of record or known to Tenant (other than encumbrances created by Landlord without the consent of Tenant), at any time in force affecting the Property. "MINIMUM REPURCHASE PRICE" shall mean the Landlord's Total Investment less the net amount (after deduction of all reasonable legal fees and other costs and expenses, including without limitation expert witness fees, incurred by Landlord in connection with obtaining any such proceeds or awards) of any proceeds of insurance paid to and retained by Landlord in accordance with Article XV of this Lease and of any Awards received by Landlord and not applied to restoration of the Property in accordance with Article XVI of this Lease. "NOTICE" shall mean a notice given pursuant to Section 30.8 hereof. "OFFICER'S CERTIFICATE" shall mean a certificate of Tenant signed by the chief financial officer or another officer authorized so to sign by resolutions adopted by the board of directors or the articles of incorporation or by-laws of the general partner of the Tenant or by any other person whose power and authority to act has been authorized by delegation in writing by the chief financial officer of the general partner of the Tenant. "OVERDUE RATE" shall mean, as of a specified date, a rate of interest equal to the Prime Rate plus five percent per annum, but in no event greater than the maximum rate of interest then permitted under applicable law. "PAYMENT DATE" shall mean any due date for the payment of any installment of Base Rent. "PERCENTAGE RENT" shall mean the percentage rent payable by Tenant to Landlord pursuant to Section 4.4. "PERCENTAGE RENT COMMENCEMENT DATE" shall mean with respect to the Fixed Term, the first day of the first full calendar month of the Fixed Term, and with respect to each Extended Term, the one year anniversary of the first day of such Extended Term. "PERMITTED ENCUMBRANCES" shall mean the matters, if any, set forth in EXHIBIT D attached hereto and incorporated herein by reference. A "PERSON" shall mean any natural person, corporation, limited liability company, business trust, association, company, partnership or government (or any agency or political subdivision thereof) or, for purposes of the definition of "Change of Control" herein, any group acting in concert (within the meaning of Section 13(d) of the Securities Exchange Act of 1934). "TENANT’S PARENT" shall mean ______________________. "PRIMARY INTENDED USE" shall mean a general acute care hospital licensed by the State, and such additional uses which are licensed or applied for on the date hereof or are permitted by Landlord from time to time hereunder. "PRIME RATE" shall mean the fluctuating rate of interest most recently announced by _____________ Bank at its principal office as its "Prime Rate." The "Prime Rate" is one of such Bank’s base rates and serves as the basis upon which effective rates of interest are calculated for those loans making reference thereto. The "Prime Rate" is evidenced by the recording thereof after its announcement in such internal publication or publications as such Bank may designate and may not be the lowest of such Bank's base rates. Any change in any of the interest rates chargeable hereunder resulting from a change in the Prime Rate shall become effective as of the Business Day on which each change in the "Prime Rate" is announced. "PROPERTY" shall have the meaning ascribed to such term in Article II. "PURCHASE AGREEMENT" shall have the meaning given to that term in the Recitals to this Lease. "REMEDIAL WORK" shall have the meaning specified in Section 8.4. "RENT" shall mean the Base Rent, Percentage Rent and Additional Charges. "SECURITY AGREEMENT" shall mean the Security Agreement of even date between Tenant, as Debtor, and Landlord, as Secured Party. "SECURITY LETTER OF CREDIT" shall have the meaning ascribed thereto in Section 29.3. "STATE" shall mean the State of __________. "TAKING" shall mean a taking or voluntary conveyance during the Term hereof of all or any part of the Property, or any interest therein, right with respect thereto or use thereof, as a result of, incidental to, or in settlement of any condemnation or other eminent domain proceedings affecting such Property, regardless of whether such Proceedings shall have actually been commenced. "TANGIBLE NET WORTH" shall mean, as of the date of determination, the sum of the following for Tenant and its consolidated subsidiaries, if any, on a consolidated basis, determined in accordance with generally accepted accounting principles (a) the amount of capital or stated capital (after deducting the cost of any shares held in the applicable entity's treasury); (b) plus the amount of capital surplus and retained earnings; or (c) in the case of a capital or retained earnings deficit, minus the amount of such deficit, (d) less the amount, if any, carried on the books of the entity and any consolidated subsidiaries of the entity for goodwill, patents, trademarks, copyrights, licenses, and other assets which are properly classified as intangible assets under generally accepted accounting principles. "TEN-YEAR TREASURY RATE" shall mean, as of the date of determination, the monthly average yield to maturity of actively traded marketable United States Treasury securities bearing a fixed rate of interest, adjusted for a constant maturity of ten years, as calculated by the Federal Reserve Board for the four preceding calendar weeks and published in said board's Statistical Release H. 15. "TENANT'S CAPITAL INVESTMENT" shall mean, for any period of determination, the lesser of (x) the aggregate amount of the increase, during the applicable period, of the original cost of (a) property, plant and equipment, (b) capitalized development expenses and (c) investments which, at the time made, are reasonably likely to contribute to the business of the Facility, and (y) the aggregate amount of the increase, during the applicable period, of capital stock, paid-in surplus, retained earnings and advances from TENANT’S PARENT (to the extent subordinated, to Landlord's satisfaction, to the prior payment in full of Tenant's obligation to Landlord under this Lease). "TENANT'S PERSONAL PROPERTY" shall mean all machinery, equipment, furniture, furnishings, movable walls or partitions, computers or other personal property, and consumable inventory and supplies, including, without limiting the generality of the foregoing, mail boxes, desks, lamps, chairs, beds, bedstands, non-affixed cabinetry, tables, and similar movable equipment, owned by Tenant and used on the Land, but in no event any items included within the definition of Fixtures. "TERM" shall mean the Fixed Term and any Extended Terms, as the context may require, unless earlier terminated pursuant to the Provisions of this Lease. "TERMINATION DATE" shall mean __________. "TOTAL RENT" shall mean the sum of Base Rent, Percentage Rent and Additional Charges. "UNAVOIDABLE DELAYS" shall mean delays due to strikes, lockouts, inability to procure materials, power failures, acts of God, governmental restrictions, enemy action, civil commotion, unavoidable casualty and other causes beyond the control of the party responsible for performing an obligation hereunder, provided that lack of funds shall not be deemed a cause beyond the control of either party hereto. (d) all easements, licenses, rights-of-way and appurtenances relating to the Land and the Improvements. 3.1 TERM OF LEASE. The initial term of this Lease shall commence on the date hereof (the "Commencement Date"), and, unless extended or terminated earlier in accordance with the provisions of this Lease, shall remain in effect until __________ (the "Fixed Term"). If for any reason Landlord cannot deliver possession of the Property (or any portion thereof) to Tenant on the Commencement Date, Landlord shall not be subject to any liability therefor, nor shall such failure affect the validity of this Lease or the obligations of Tenant hereunder or extend the Term hereof, but in such case, Tenant shall not be obligated to pay Rent until possession of the Property is tendered to Tenant. 3.2 OPTION TO EXTEND TERM OF LEASE. Landlord hereby grants to Tenant an option to extend the term of this Lease for three consecutive ten-year renewal terms (the "Extended Terms"). Each Extended Term shall be on the same terms and conditions as those set forth herein for the Fixed Term (including, but not limited to, Tenant's obligation to pay Percentage Rent), except that Base Rent shall be paid at a rate equal to the then current Fair Market Rental which, unless otherwise mutually agreed to by Landlord and Tenant, shall be determined by appraisal pursuant to the provisions of Article XXV. In no event, however, shall the Base Rent for any Extended Term be less than ____%, nor more than ____%, of the total amount of Base Rent and Percentage Rent reserved under this Lease for the Base Year for such Extended Term. Tenant shall pay to Landlord, on the first day of each Extended Term, an Additional Charge equal to 0.5% of the Landlord's Total Investment. Each such option may only be exercised by Tenant if, at the time such option is exercised, (a) this Lease has not expired or been sooner terminated and (b) an Event of Default is not continuing, and shall be exercised by Tenant by delivery of Notice to that effect to Landlord not less than 180 nor more than 360 days prior to the expiration of the then current Term. Tenant's exercise of any option to extend the term of this Lease for an Extended Term pursuant to this Section 3.2 shall constitute Tenant's irrevocable and binding commitment to lease the Property on the terms stated in this Lease for the whole of such Extended Term. If Tenant is unable to exercise any option due to the provisions of this Lease, the time during which such option may be exercised shall not be extended or enlarged. Time is strictly of the essence with respect to the requirement that Tenant give timely Notice of its exercise of any options hereunder, and Tenant's failure timely to exercise any option strictly in accordance with its terms shall constitute a material, irredeemable and incurable failure to satisfy a condition precedent to the vesting of any rights in Tenant pursuant to the option, and Tenant hereby expressly waives any right to claim relief from forfeiture or any other form of equitable relief from the consequences of any untimely exercise of any such option strictly in accordance with its terms. The implied covenant of good faith and fair dealing, if any, under this Lease shall not be construed to impose upon Landlord any obligation to notify Tenant in advance of the impending deadline for the exercise of any option hereunder, nor shall it obligate Landlord to excuse the tardy exercise of any option, however slight. The failure of Tenant to exercise any of the options for the Extended Terms within the respective times specified in this Section shall thereby terminate any remaining such options. 4.1 PAYMENT OF LANDLORD'S TRANSACTION EXPENSES. Tenant shall pay to Landlord all Landlord's Transaction Expenses within 30 days of Landlord's transmittal to Tenant of written invoices for all Landlord's Transaction Expenses, in a form reasonably acceptable to Tenant. 4.2 PAYMENT OF BASE RENT, PERCENTAGE RENT AND ADDITIONAL CHARGES. During the Term, Tenant shall pay to Landlord at the times specified herein, in lawful money of the United States of America, without right of offset or deduction, by wire transfer of immediately available funds to such account or accounts as Landlord may designate from time-to-time in a Notice, the Rent. 4.3 BASE RENT. Commencing on the first Business Day of the first full calendar month occurring coincident with or after the Commencement Date and, thereafter, on the first day of each calendar month occurring during the Term hereof, Tenant shall pay to Landlord Base Rent in an amount determined by dividing (x) the then annual Base Rent by (y) 12, provided that the first payment of Base Rent shall include an additional amount for any partial calendar month occurring between the Commencement Date and the date of the first payment of Base Rent. Any payment of Base Rent for a period of less than one calendar month shall be prorated based upon a 30-day month and the actual number of days elapsed. (a) "Percentage Rent" shall accrue, in the manner and at the times set forth in this Section 4.4, in an amount equal to six percent of the Excess Revenues for any Calculation Period commencing during the Fixed Term and in an amount equal to ______ percent of the Excess Revenues for any Calculation Period commencing during any of the Extended Terms; provided, however, that no Percentage Rent shall accrue during the first Calculation Period commencing during any Extended Term. On _____________, and thereafter on the 45th day after the last day of every Calendar Quarter commencing during the Term of this Lease, Tenant shall pay Percentage Rent on a quarterly basis. The quarterly payment shall be determined by (i) annualizing the Gross Revenues for the portion of the Calculation Period ended (prorated for any partial period) as of the end of the last Calendar Quarter, (ii) subtracting from such annualized Gross Revenues the Base Gross Revenues to arrive at the Excess Revenues for such completed portion of the Calculation Period, (iii) multiplying such Excess Revenues by six percent or five percent, as the case may be, to arrive at annualized Percentage Rent, (iv) multiplying such annualized Percentage Rent by a fraction the numerator of which is the number of days elapsed in the Calculation Period through the end of the last Calendar Quarter and the denominator of which is 360 and (v) subtracting from the product thus obtained any Percentage Rent payments previously made with respect to such Calculation Period. (b) Notwithstanding subsection (a) of this Section 4.4 to the contrary, in no event shall the increase in Percentage Rent due and payable under this Lease with respect to any Calculation Period during the Fixed Term be less than an amount equal to two percent of aggregate Base Rent and Percentage Rent reserved hereunder for the immediately preceding Calculation Period, nor shall it be greater than the amount determined by multiplying (i) the Applicable CPI Percent by (ii) the aggregate Base Rent and Percentage Rent reserved hereunder for the immediately preceding Calculation Period. In no event, however, shall the Percentage Rent due and payable under this Lease with respect to any Calculation Period during the Fixed Term be greater than the amount which when added to the Base Rent reserved for such Calculation Period equals $_____________. (c) Notwithstanding subsection (a) of this Section 4.4 to the contrary, in no event shall the increase in Percentage Rent due and payable under this Lease with respect to any Calculation Period during any Extended Term be less than an amount equal to two percent of aggregate Base Rent and Percentage Rent reserved hereunder for the immediately preceding Calculation Period, nor shall it be greater than the amount determined by multiplying (i) the Applicable CPI Percent by (ii) the aggregate Base Rent and Percentage Rent reserved hereunder for the immediately preceding Calculation Period. (d) Notwithstanding subsection (a) and (c) of this Section 4.4 to the contrary, if the aggregate amount of Base Rent and Percentage Rent for any Calculation Period commencing during an Extended Term reaches a level (the "Pause Point") at which Landlord realizes a percentage return on the Landlord's Total Investment for such Calculation Period equal to the sum of (x) the Base Rental Rate for such Calculation Period and (y) _______ basis points, Percentage Rent shall cease to accrue for the remainder of such Calculation Period. 4.5 CONFIRMATION OF PERCENTAGE RENT. Tenant shall utilize or cause to be utilized, an accounting system for the Property in accordance with GAAP, which will accurately record and reflect all Gross Revenues for each Calculation Period and each Calendar Quarter ending during such Calculation Period. Tenant shall retain, for at least six years following the end of each Calculation Period (and in all events until the reconciliation described in Section 4.6 for such Calculation Period has been made), reasonably adequate records conforming to the aforementioned accounting system showing all Gross Revenues for such Calculation Period. Landlord, at its own expense, except as provided hereinbelow, shall have the right, from time to time, to audit or cause to be audited by its independent accountants or other independent authorized representatives the information set forth in the Officer's Certificate regarding Percentage Rent referred to in Section 4.6. In connection with such audits, Landlord (or such accountants or authorized representatives, as the case may be) may examine, audit and copy Tenant's records with respect thereto (including supporting data and sales and excise tax returns), subject to any prohibitions or limitations on disclosure of any such data under applicable law or regulations, including, without limitation, any duly enacted "Patients' Bill of Rights" or similar legislation and such reasonable limitations as may be necessary to preserve the confidentiality of the hospital-patient relationship and the physician-patient privilege. If any such audit discloses a deficiency in the payment of Percentage Rent, Tenant shall forthwith pay to Landlord the amount of the deficiency, together with interest at the Overdue Rate, for the period from the date when such payment should have been made to the date when such payment is made. If any such audit discloses that Gross Revenues actually received by Tenant for the Calculation Period to which such audit relates exceed those reported by Tenant by more than five percent, Tenant shall pay all of Landlord's costs, charges, fees and expenses related to such audit. Any proprietary information obtained by Landlord pursuant to the provisions of this Section 4.5 shall be treated as confidential, except that, subject to appropriate confidentiality safeguards, such information may be used in any litigation between Landlord and Tenant and may be disclosed by Landlord to Owner, Landlord's lenders or prospective lenders. The obligations of Tenant contained in this Section shall survive the expiration or earlier termination of this Lease. 4.6 CERTIFICATES REGARDING PERCENTAGE RENT. Each payment of Percentage Rent shall be delivered to Landlord, together with an Officer's Certificate setting forth the calculation for the most recently completed Calendar Quarter and the Calculation Period to date (except in the event no payment is due, in which case such Officer's Certificate shall be delivered to Landlord at such time as such payment would otherwise be due). In addition, within 90 days after each Calculation Period, Tenant shall deliver to Landlord an Officer's Certificate reasonably acceptable to Landlord setting forth the Gross Revenues, together with Tenant's computation of Percentage Rent paid (or payable) for such Calculation Period. If the Percentage Rent due for any Calculation Period, as shown in any such certificate, exceeds the sum of the quarterly payments of Percentage Rent previously made by Tenant with respect to such Calculation Period, Tenant promptly shall remit to Landlord the amount of such deficit. If the Percentage Rent for such Calculation Period, as shown in such certificate, is less than the sum of the quarterly payments of Percentage Rent previously made by Tenant with respect to such Calculation Period, Landlord shall credit such sum to the payment of Percentage Rent next due. The obligation of Tenant to pay to Landlord Percentage Rent shall survive the expiration or earlier termination of the Term, and a final reconciliation (taking into account, among other relevant adjustments, any contractual allowances which are accrued after such expiration or termination date but which relate to Gross Revenues accrued prior to such expiration or termination date and Tenant's good faith best estimate of the amount of any unresolved contractual allowances) shall be made not later than seven years after expiration or termination. Tenant shall advise Landlord within 60 days after such expiration or termination date of Tenant's best estimate at that time of the approximate amount of such adjustments, which estimate shall not be binding on Tenant. 4.7 ADDITIONAL CHARGES. Subject to Article XIII hereof, Tenant shall pay and discharge as and when due and payable all Impositions and other amounts, liabilities and obligations which Tenant assumes or agrees to pay under this Lease. If Tenant fails or refuses to pay any of the items referred to in the immediately preceding sentence, Tenant shall promptly pay and discharge every fine, penalty, interest and cost which may arise or accrue for the non- payment or late payment of such items. The aforementioned amounts, liabilities, obligations, Impositions, fines, penalties, interest and costs are referred to herein as "ADDITIONAL CHARGES." The Additional Charges shall constitute Rent hereunder. If any Rent (but as to Additional Charges, only those which are payable directly to Landlord) shall not be paid on its due date, Tenant shall pay to Landlord on demand, as an Additional Charge, a late charge to the extent permitted by law, computed at the Overdue Rate on the amount of such overdue Rent from the due date of such Rent to the date such Rent is paid. Any payment by Tenant of Additional Charges to Landlord pursuant to any requirement of this Lease shall relieve Tenant of its obligation to pay such Additional Charges to the entity to which they would otherwise be paid. (a) TRIPLE NET LEASE. This Lease is what is commonly called a "net net net lease," it being understood that Landlord shall receive all Rent as provided in this Article free and clear of any and all Impositions, encumbrances, charges, obligations or expenses of any nature whatsoever in connection with the ownership and operation of the Property. In addition to the Rent reserved by this Article, except as expressly provided herein to the contrary, Tenant shall pay to the parties respectively entitled thereto all Impositions, insurance premiums, operating charges, maintenance charges, construction costs and any other charges, costs and expenses which arise or may be contemplated under any provisions of this Lease during the Term hereof. All of such charges, costs and expenses shall constitute Rent, and upon the failure of Tenant to pay any such costs, charges or expenses, Landlord shall have the same rights and remedies as otherwise provided in this Lease for the failure of Tenant to pay Rent. It is the intention of the parties hereto that this Lease shall not be terminable for any reason by the Tenant and that Tenant shall in no event be entitled to any abatement of or reduction in Rent payable under this Lease except as herein expressly provided. Any present or future law to the contrary shall not alter this agreement of the parties. (b) BANKRUPTCY. Provided that there has been no rejection hereof by Landlord or any trustee or receiver of Landlord, Tenant covenants and agrees that it shall remain obligated under this Lease in accordance with its terms, and that Tenant shall not take any action to terminate, rescind or avoid this Lease, notwithstanding the bankruptcy, insolvency, reorganization, composition, readjustment, liquidation, dissolution, winding-up or other proceeding affecting Landlord or any assignee of Landlord in any such proceeding and notwithstanding any action with respect to this Lease which may be taken by any trustee or receiver of Landlord or any such assignee in any such proceeding or by any court in any such proceeding. (i) In the event that Tenant shall file a petition, or an order for relief is entered against Tenant, under Chapter 7, 9, 11 or 13 of the Bankruptcy Code, 11 U.S.C.S. 101 et seq. (the "BANKRUPTCY CODE") and the trustee of Tenant shall elect to assume this Lease for the purpose of assigning the same, such assumption or assignment may only be made if all the conditions of subsections (ii) and (iii) of this Section 4.8(b) are satisfied. If Tenant's trustee or debtor-in-possession, as the case may be, shall fail to elect to assume this Lease within 60 days (or additional time fixed by the court) after such trustee shall have been appointed, or the date of filing of the petition, at Landlord's election (and in its sole and absolute discretion) this Lease shall be deemed to have been rejected and, in such event, Landlord shall thereupon immediately be entitled to possession of the Property without further obligation to the trustee or Tenant, and this Lease shall be cancelled, but Landlord's right to be compensated for damages in the bankruptcy proceedings shall survive such cancellation. (II) within 30 days from the date of such assumption, the trustee (or debtor-in-possession) will cure all non- monetary defaults under this Lease or commence to cure within 30 days and thereafter diligently pursue to completion. (II) the obligations imposed upon the trustee (or debtor-in-possession) shall continue with respect to Tenant after completion of bankruptcy proceedings. (II) disrupt, in Landlord's reasonable judgment, the reputation and profitability of the Property. (II) an order shall have been entered segregating sufficient cash payable to Landlord, or there shall have been granted a valid and perfected first lien and security interest in property of the Tenant or trustee (or debtor-in-possession), acceptable as to value and kind to Landlord, to secure to Landlord the obligation of the Trustee (or debtor-in- possession) to cure the monetary or non-monetary defaults under this Lease within the time periods set forth above. (E) the assignee has demonstrated that its intended use of the Property is consistent with the terms of this Lease and will not diminish the reputation of the Facility, or violate any "exclusive" which has been granted by Tenant to any permitted subtenant in the Property. (iv) When, pursuant to the Bankruptcy Code, the trustee (or debtor-in-possession) shall be obligated to pay reasonable use and occupancy charges for the use of the Property or any portion thereof, such charges shall not be less than the Rent. (v) Neither Tenant's interest in the Lease, nor any lesser interest of Tenant herein, nor any estate of Tenant hereby created, shall pass to any trustee, receiver, assignee for the benefit of creditors or any other person by operation of law or otherwise unless Landlord shall consent to such transfer in writing. No acceptance by Landlord of rent or any other payments from any such trustee, receiver, assignee or person shall be deemed to have waived, nor shall it waive the need to obtain Landlord's consent to, or Landlord's right to terminate this Lease for, any transfer of Tenant's interest under this Lease without such consent. (vi) Any person to whom this Lease is assigned pursuant to the provisions of the Bankruptcy Code shall be deemed without further act or deed to have assumed all the obligations arising under this Lease on or after the date of such assignment. Any such assignee shall, upon demand, execute and deliver to Landlord an instrument confirming such assumption. 5.1 PAYMENT OF IMPOSITIONS. Tenant shall pay, or cause to be paid, all Impositions prior to delinquency and before any fine, penalty, interest or cost may be added for non-payment (subject to Tenant's rights of contest pursuant to the provisions of Article XIII). Such payments shall be made directly to the authorities levying such Impositions, if possible. Tenant shall, promptly upon request by Landlord, furnish to Landlord original or certified copies of receipts or other reasonably satisfactory evidence of such payments. Tenant's obligation to pay Impositions shall be deemed absolutely fixed upon the date such Impositions become a lien upon the Property or any part thereof. Notwithstanding the foregoing, if any such Imposition may, at the option of the payor, lawfully be paid in installments (whether or not interest shall accrue on the unpaid balance of such Imposition), Tenant may pay the same (and shall pay any accrued interest on the unpaid balance of such Imposition) in installments, and in such event shall pay such installments (subject to Tenant's right of contest pursuant to the provisions of Article XIII) as the same become due and before any fine, penalty, premium, further interest or cost is added thereto. Landlord shall, at its expense and to the extent required or permitted by applicable laws and regulations, prepare and file all returns with respect to Landlord's net income, gross receipts, sales, use, single business, transaction privilege, rent, ad valorem and franchise taxes (without waiving Landlord's right to reimbursement therefore from Tenant to the extent that the same constitutes Impositions), and with respect to taxes on Landlord's capital stock. Tenant shall, at its expense, and to the extent required or permitted by applicable laws and regulations, prepare and file all other tax returns and reports with respect to any Imposition as may be required of Tenant by governmental agencies or authorities. If any refund shall be due from any taxing authority with respect to any Imposition paid by Tenant, the same shall be paid over to and retained by Tenant unless an Event of Default shall have occurred hereunder and be continuing, in which case such refund shall be paid over to and retained by Landlord. Any such funds retained by Landlord due to an Event of Default shall be applied as provided in Article XVII. Landlord and Tenant shall, each upon a request by the other, provide such information as is maintained by the party to whom the request is made with respect to the Property as may be reasonably necessary to prepare any required returns or reports. If any governmental agency or authority classifies any property covered by this Lease personal property, Tenant shall file all personal property tax returns in such jurisdictions where it may legally so file. Landlord, to the extent it possesses the same, and Tenant, to the extent it possesses the same, will provide to the other party, promptly upon request, cost and depreciation records reasonably necessary for filing returns for any property so classified as personal property. If Landlord is legally required to file any personal property tax returns, Landlord shall provide Tenant with copies of any assessment notices with respect thereto in sufficient time for Tenant to file a protest with respect thereto if it so elects pursuant to Article XIII. If no Event of Default is then continuing, Tenant may at its option and sole cost and expense, upon Notice to Landlord, protest, appeal or institute such other proceedings as Tenant reasonably may deem appropriate to effect a reduction of real estate or personal property assessments so long as such action is conducted in good faith and with due diligence. In such event, Landlord, at Tenant's sole cost and expense, shall fully cooperate with Tenant in such protest, appeal, or other action. Tenant hereby agrees to indemnify, defend, save and hold Landlord harmless from and against any and all losses, demands, claims, obligations and liabilities against or incurred by Landlord in connection with such cooperation by Landlord. Billings by either party to the other for reimbursement of personal property taxes shall be accompanied by copies of a bill therefor and evidence of payments thereof which identify the personal property with respect to which such payments have been made. 5.2 NOTICE OF IMPOSITIONS. Landlord shall give prompt Notice to Tenant of all Impositions payable by Tenant hereunder of which Landlord at any time has knowledge. Notwithstanding the foregoing, however, Landlord's failure to give any such Notice shall in no way diminish Tenant's obligations hereunder to pay such Impositions, but Landlord shall be responsible for any fine, penalty or interest resulting from its failure to give such notice and any default by Tenant hereunder shall be obviated for a reasonable time (which shall not exceed fifteen (15) Business Days) after Tenant receives Notice of any Imposition which it is obligated to pay. 5.3 ADJUSTMENT OF IMPOSITIONS. Impositions imposed with respect to the tax period during which the Term expires or terminates shall be adjusted and prorated between Landlord and Tenant, whether or not such Imposition is imposed before or after such expiration or termination, so that Tenant is only obligated to pay that portion of such Imposition(s) pertaining to the tax period within the Term. The obligation of Tenant to pay its prorated share of Impositions shall survive expiration or earlier termination of this Lease. 5.4 UTILITY CHARGES. Tenant shall pay or cause to be paid all charges for all utilities, including but not limited to electricity, power, gas, oil and water, used in the Property during the Term. 5.5 INSURANCE PREMIUMS. Tenant shall pay or cause to be paid all premiums for insurance coverage required to be maintained pursuant to Article XIV.